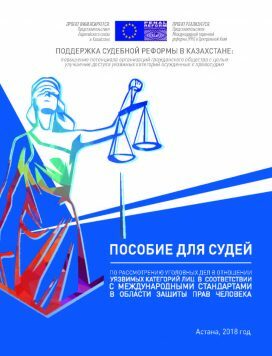 This publication, Пособие для судей по рассмотрению уголовных дел в отношении уязвимых категорий лиц в соответствии с международными стандартами в области защиты прав человека (A manual for judges on criminal cases related to vulnerable groups in accordance with the international standards in the area of protection of human rights) was prepared by ex-judge Kisikova Daniya Ganievna and developed within the framework of a project implemented by PRI’s Central Asia Office, ‘Support to Judicial Reform in Kazakhstan: Empowering civil society organisations (CSOs) to improve access to justice for vulnerable groups in Kazakhstan’, which is funded by the Delegation of the European Union to Kazakhstan. The project aims to strengthen the cooperation between judicial agencies and CSOs to ensure the protection of the rights and interests of vulnerable groups of offenders and support organisations to provide key services. The manual aims to assist judges and representatives of CSOs with the correct application of international standards and national legislation in the imposition of punishment, with respect to vulnerable categories of citizens, including those in pre-trial detention and those who have been given life/long-term imprisonment or the death penalty. The manual is intended to assist judges in preventing cases of excessive cruelty and avoid unreasonable refusal for release from prison.